NOTE: Our friend Damian Kevitt, is the survivor of a horrible hit and run in Griffith Park. His story, subsequent amputation and transformation into a hero of recovery turned something awful into an incredible mission to make the world a better place. It remains one of the most awesome things we’ve had the honor of being a small part of. We hope that you make time this Sunday, to participate as a cyclist, runner or walker. Go Damian!! LISTEN!! 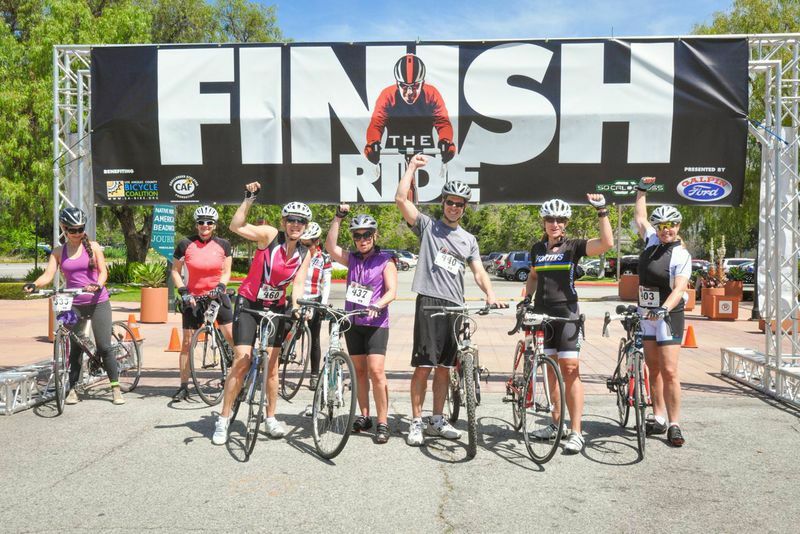 Finish the Ride is happening…again! What was a single event to commemorate a terrible event has turned into a movement, for safe city streets and ending hit and run crimes. A movement to support walking, bike riding, running, skateboarding, and having fun without fear of becoming roadkill. It starts at 7:30am in Hollywood with VIP speakers, including the LA DOT General Manager Seleta Reynolds, Councilman Busciano, Councilman O’Farrell and a very special guest you’ll want to see. The Run, Ride and Walking events roll at 8 AM. From 6 easy miles all the way up to 50 miles, a 10K Run, 10K Walk and 10K Roll. Yes, EVERY form of active transportation is represented, skate-boarders, roller-blades, roller-skaters, even unicyclists. Full support with activities, water and rest stops, SAG wagon, etc. Everything finishes at The Autry Museum south lawn in Griffith Park with food, live music, dancing, BBQ, beer, ice cream, beer, yoga, free t-shirt, finishing medal (or ribbon, depending on the event), great goodie bag with free swag, raffle, silent auction, free stuff and good times. Did you know that between last year’s event, awareness campaigns, legislation and a lot of work, we dropped hit and run crimes by 16%. It all started with a little bike ride a year ago. Have a great time. Help make LA a safer place to live. What are you waiting for? REGISTER! L.A. Bike Trains turned 2 years old! While most of our programs are focused on Los Angeles, we’re also working to bring these fun and helpful learning tools to other cities – and countries! In February 2015 executive director Nona Varnado will be speaking in Bogota (ciclovia) and Medellin (World Bike Forum), Colombia on how to bring DIY bike culture to communities to create positive social change. Bicycle Culture Institute is a non-profit organization focused on mentorship, developing a resource library and broad media attention for a diverse range of voices about bicycling. We help other non-profits, coalitions, co-ops, ride groups and large companies focus on their primary mission by developing high quality education programs, workshops and training. Based on 15 years of innovative cycling culture projects including: race development, community organizing, brand development and traditional advocacy. We believe in making friends, learning from other cities and individuals around the globe to build connections between people. You can support BCI’s general operating fund or make sure your donation goes 100% to the #LABIKETRAINS mobile app. We’re pretty excited that this little project has some big potential to transform cities like LA into great places to ride for everyday transportation. the official L.A. Bike Trains ‘Conductor’s Kit’ a reflective saddle bag with Lezyne brand mini-pump, tools, lever/patch kit, energy snack and first aid items. Thanks for a great 2014. Help us make L.A. Bike Trains better and more accessible for people all over Los Angeles in 2015! Only 10 questions will make a big difference. Make GREAT use of your 2014 charity dollars and help us reach $50,000. The new app will connect up to 1 million people in LA County with great bike routes, education and encouragement to make riding a bike to work and school AWESOME. Former conductor and lead tech super volunteer, Christopher Lovejoy, pitches the L.A. Bike Trains mobile app development to the CODE FOR LA meetup. Code for Los Angeles is the Los Angeles Code for America Brigade, a network of civic-minded technologists who contribute their skills toward using the web as a platform for local government and community service. Check them out or contact us if you want to help us make a mobile app! L.A. Bike Trains, and groups like it in cities across the country, are helping employees get to work without getting into a car. For the past two years, cycling advocate Nona Varnado and a handful of overworked, enthusiastic volunteers have been building the social infrastructure and training for every Angeleno to bicycle to work and school. Yes, bicycle—in traffic-plagued Southern California, no less, where drive-through restaurants were invented because apparently, cars were so beloved that Angelenos wanted to eat meals in them. Despite her past as a bicycle messenger in New York City, Varnado found that if she wanted to cycle safely in Los Angeles, she’d need a friend to personally show her the routes, show her that it was possible to get around the city without the protective metal cage of a vehicle. L.A. Bike Trains is an extension of that experience, the friend who shows you it’s possible. One morning every workweek, 10 volunteer “conductors” meet to safely shepherd newbie commuter cyclists across the city to work for the a.m. commute. If your quitting times align, you can join the train again for the ride home or just ride back the same way you came. Varnado calls her riders her “ducks,” and the program is free for anyone with a bike (and presumably a helmet), and for your first few rides, your conductor will personally pick you up at your house and show you the best route to get to your meeting spot. Conductors carefully select their routes to be the optimal experience for a cyclist of any experience level, figuring in hill grades, bike lanes, and even scenic beauty. Routes run from Pasadena to downtown and from Silver Lake to Santa Monica, a daunting 15-mile, cross-city route made accessible by expert conductor Wesley High. High even records his Silver Lake to Santa Monica ride every day with a helmet-mounted GoPro to catalog how safe his routes are and adjust accordingly. Sometimes drivers cut him off and screech to a stop. Sometimes drivers angrily accuse him of taking the lane to personally ruin their day. The insults hurled can be mind-boggling, but High takes every possible measure to ensure his riders’ safety, going as slowly as needed and making sure every person feels comfortable enough to take the lane when necessary. The safety-in-numbers concept has pushed like-minded cyclists in other U.S. cities, such as New York City; Portland, Oregon; and New Orleans, to implement bike trains. The notion extends beyond commuters through the national organization Safe Routes, which uses parent-led bike trains to get children safely to school on bikes. According to a 2014 report, bike ridership in Los Angeles has gone up 7.5 percent since 2011, with a preliminary count of 18,000 riders across the city. That’s paltry compared with the half-a-million bikers in New York City. But the promising news is that L.A. Bike Trains has more permanent routes—and more on the way—than any other city’s bike train program, suggesting that Angelenos are interested in better cycling infrastructure. L.A. Councilmember Mike Bonin used the report as an impetus to ask for more city transportation funds to be allocated to increase bicycle ridership. In New York City, the Department of Transportation implemented this type of plan in 2009 with a goal of doubling ridership by 2012 but reached the goal a year early. For Varnado, who also works part-time with the nonprofit advocacy and education group L.A. County Bicycle Coalition, the L.A. Bike Trains program is already a success, because she’s able to see her ducks growing up and “graduating” to ride on their own. Some of these graduated riders have developed their own routes or institute programs in their workplaces. The UCLA Bicycle Coalition, for instance, reached out to Varnado for a one-day bike-to-school event; it was such a success that the UCLA Sustainability department allocated resources and work hours for a permanent route to UCLA. Varnado said LABT has collected hundreds of commuter surveys from former and current riders, and when it’s ready, it can use the data to help implement change and possibly get these programs funded. Right now, it relies on donations from people who can see the benefits without the hard data, and it’s hoping Los Angeles is a viable contender for a community grant from PeopleForBikes, a privately funded organization. “If politicians don’t start realizing that young people, families, want safe communities that are not just bike accessible but walking too, then everything else will just be biding our time,” Varnado said. And we’ll be biding that time in traffic. A Wolfe has covered arts, entertainment, and politics for Good, Vice, Flaunt, and other publications. Want to see a Bike Train from the rider’s perspective? Check this out! L.A. Bike Train Route 008 Culver City to UCLA from Gary Cziko on Vimeo. In Summer 2014 we applied for the LA2050 CONNECT grant to ‘win’ 100K in project funding. We didn’t get it (boo!) but we did learn a lot about what we need to do to better serve more of LA County. The work, adventure and fundraising to develop the mobile app and the number of routes continues! If you want to help us succeed, DONATE! L.A. Bike Trains! Led by experienced ‘conductors’ on the best routes across LA – making biking a fun, safe and reliable way to get to work. IN ONE SENTENCE, PLEASE DESCRIBE WHAT YOUR ORGANIZATION DOES. The Bicycle Culture Institute is a 501(c)3 non-profit dedicated to connecting people to new (bicycle) ideas. DOES YOUR PROJECT IMPACT LOS ANGELES COUNTY? CHECK ONLY ONE. PLEASE WRITE A SAMPLE TWEET TO DESCRIBE YOUR SUBMISSION. WHICH AREA(S) OF LA DOES YOUR PROJECT BENEFIT? CHECK ALL THAT APPLY. We are working to develop the foundation needed to expand into all areas of LA County, from building capacity to key relationships. The idea: Individuals can create social solutions to hard problems that frequently seem insurmountable or dependent on major infrastructure. Individuals only change their behavior based on 1:1 positive experiences. 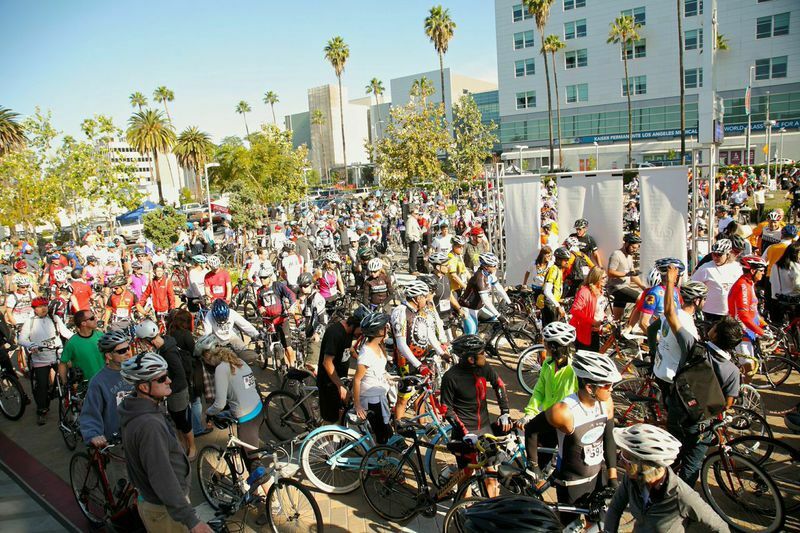 = A social/educational program making bicycling feel safe, fun and accessible – in the middle of car-centric Los Angeles! #5 Connect LA Bike Trains to major educational and employment organizations to help facilitate bicycling to major commuter destinations. Right now we have the benefit of being almost 2(!) years old. We’ve got a solid team, program and lots of community support – even internationally! Cities from San Francisco to London have asked “how do you do it? We want Bike Trains in our city!” But even in LA few people who would benefit the most have heard of us or know how we can make their commute and their life better. We also need a huge increase in commuter survey responses. The tactic we’ve taken is that in addition to our own collection, we are working with major transportation and city agencies to get access to their data as well. Everything is about breaking down barriers – from helping people learn how to safely and comfortably bike commute on their own or with us. No topic is too silly; most are worried about sweating and not looking professional enough, or too serious.. we are always addressing safety and helping people get over real safety concerns. We do that by showing up, running on time and being generous with everything we know. Being an LA Bike Trains conductor is a big job and only the most kind hearted, energetic and wonderful people can do it. Conductors are unpaid volunteers who spend a lot of time making sure their communication is great, that riders feel safe and have a good time and participate in any number of other development or advocacy work. That means that even beyond the Bike Trains, we’re developing an incredible volunteer network across Los Angeles. After primary conductors, we have ‘back up’ conductors. We are always looking for volunteer web/mobile developers, event coordinators, community organizers, educators and happy people. Right now our volunteer list is 100+ strong and growing. We’ve got an unreleased app ‘beta’ but we need funding and specific development talent to get it to the point where we can release it into the wilds of LA city streets safely. 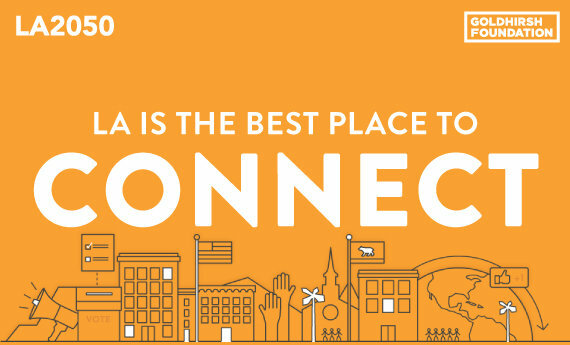 HOW WILL YOUR IDEA/PROJECT HELP MAKE LA THE BEST PLACE TO CONNECT TODAY? IN 2050? Today, L.A. Bike Trains is a novel approach using a fun social experience to educate Angelinos about bicycles for transportation. We primarily address crude concerns, from safety fears to a total lack of knowledge on how to navigate the city without a car and what stuff is needed. We answer a lot of the same questions again, and again. All of these questions can be found online, but we have discovered that the most important element in creating behavior change is emotional, via 1:1 human experience. We provide that and inspiration for taking the next steps. We’re also at an exciting intersection – helping define what multi-modal transportation looks like. From using our experience to assist with Open Streets events, collaborate with major transportation/urban development projects and the creation of innovative bike friendly routes via a mobile app… there’s no limit to where we can grow in the future. Right now the biggest need is basic education and advocating for infrastructure developments, while creating an authentic bicycle culture that makes Angelinos more resilient. As infrastructure improves and social acceptance of bicycling for transport gains, we’ll be able to focus on bicycle specific innovation within LA’s ever changing urban transit mix. Having built a massive network of volunteers, participants, collaborators and channels of communication we’ll be able to facilitate an evolution that may bring us to work more closely with mass transit, urban planning, the bicycle industry itself or any number of potential avenues. What doesn’t change between now and 2050 is our commitment to using the bicycle as the greatest tool we have for connecting individuals and communities in Los Angeles. The bicycle is a great equalizer between rich and poor, languages and backgrounds. Transportation equality and access is one of the greatest projects the city must undertake to allow all of its’ citizens access to educational, recreation and occupational opportunity. WHOM WILL YOUR PROJECT BENEFIT? PLEASE BE SPECIFIC. Like most start-up projects, we’ve had to begin in communities that are naturally receptive to what we’re doing. It’s no surprise that we’re popular in the young, affluent and very Caucasian neighborhood of Silverlake, but the real promise is in the Latino communities of East LA and beyond. Reaching diverse and low income populations – the ones who stand to gain the most from this project – requires a lot more effort. From being able to faithfully offer communication, assistance and service in multiple languages. It’s also important to have the resources necessary to reach those populations in meaningful ways. Too many projects attempt to reach out to Spanish speaking community by simply offering a website in Spanish. We understand that we need to be able to fully support communities that are predominantly Spanish speaking. That means working with existing groups, recruiting existing leaders and research into what is most needed. Having the time, thoughtfulness and creativity to bridge the project into a different framework is how we plan to be successful in positively impacting divers populations in Los Angeles. Incremental, rather than blanket progress. To do that faithfully it has to happen organically and that is extremely difficult to predict. 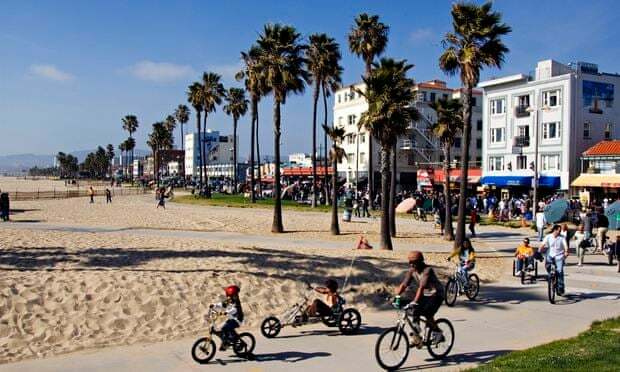 L.A. Bike Trains is in the position to most positively impact disadvantaged and low-income communities. By making the bicycle (often in combination with public transport) a reliable and desirable transportation option, individuals stand to gain mobility, save a significant percentage of their income and begin to solve some of the most pressing health issues seriously affecting low-income populations. We address this goal through an all-inclusive, holistic approach. These organizational collaborators range from organizations that we can rely on to help us promote our work to their audiences, to those that provide more in-depth assistance with knowledge or professional connections to being able to support us financially or with ‘in-kind’ donations. These are the organizations that are our “first tier” whenever we need anything or just want to explore possibilities. The primary collaborations that we want to develop are with university bicycle coalitions. A successful test run and development of 2 new routes going to UCLA was launched during bike week May 2014. We now want to deepen that relationship so that more staff and students will utilize L.A. Bike Trains as their transportation resource. L.A. Bike Trains would like UCLA to support those routes via funding, promotion and technical assistance – such as data collection and research. With a UCLA collaboration in process, it can serve as a template for additional collaborations with other schools, such as USC, but also large employers from the city of LA to Sony Entertainment. HOW WILL YOUR PROJECT IMPACT THE LA2050 “CONNECT” METRICS? One of the strongest reasons that people choose to commute by bike is the mental and physical well-being that it creates. LA Bike Trains makes that even better by providing a positive social network to reinforce and support individuals. It’s inspiring enough that people want to help. And ride. And get active in their communities when they realize all the silly barriers keeping Angelinos from having the kind of healthy accessible transportation network we deserve. New and sometimes scared participants are comforted by the fact that most of our routes run in parallel to bus or train transport options. LA Bike Trains is at an exciting place to bridge the “first mile – last mile” question of how to transition a population used to auto transport to a multi-modal approach. #1 Are the trains running? On time & on schedule? Benchmark service reliability. Right now we are already keeping track of participation and internet traffic. From that we can extract a lot of basic information. The general website traffic includes commuter survey responses, sign ups by route and general volunteer responses. We can see what parts of the city are responding most frequently and what communities seem to be conspicuously absent from online interaction. Because we use MailChimp to communicate with anyone that signs up for a specific route, we can also track the engagement of who is reading emails and further measure that by counting who is showing up and participating each week. Butterflies: these are the folks who love us on social media or just think the idea is great. They might volunteer at an event, or get inspired to ride more often on their own, but don’t sign up and participate in specific routes. Butterflies can become Regulars or Graduates. Regulars: The people who sign up and ride with us regularly. Graduates: They show up not knowing very much and require a lot of education, help and encouragement. After 1-3 rides they disappear. Why? Because now they’re fully capable bike commuters and can bike commute whenever or however they want! Without educated, experienced and dedicated leadership building out the foundations of this project it cannot scale or develop beyond occasional group rides organized within a friend/work network. Without a small army of well-organized volunteers, there’s no way rides will be consistent or reliable over time. That means that although conductors and volunteers are unpaid, that there is a need for paid leadership and consultants to help the organization develop. At a minimum, websites, fliers and extra bike tubes add up. Finding money from outside sources to keep from needing volunteers work for free and also pay for organizational costs is not sustainable. We need ‘start up’ funds to help us develop the app, new routes and education programs, while paying for specific management roles that can help L.A. Bike Trains grow to a comprehensive city level outreach and full program capacity. Even as we work on those goals, we’ll need to investigate options for on-going fiscal sustainability. As a grassroots project, it’s hard to get the word out. Then, once people know who you are, you’ve got to keep them engaged and reminded how exactly you can help them and other people. Right Now. While that’s frustrating (and a lot of work that isn’t the direct effort of leading actual routes) it is the #1 reason why bike train projects – all over the world – have quietly failed after brief attempts. The biggest challenge in any bike train is getting participation and continually infusing fresh sign ups into the system so that it stays vibrant. The natural tendency is to assume that people will discover the route, sign up and show up every week with no prompting. In truth, nothing could be a better recipe for conductor burnout and lack of participation. *Credit: Always Be Hollerin’ ABH! Is the battle cry of good friend and fellow bike-entrepreneur Iggy Cortez, owner of Far West Courier based in Santa Monica. That guy defines awesome. EXPLAIN HOW IMPLEMENTING YOUR PROJECT IN THE NEXT TWELVE MONTHS IS AN ACHIEVABLE GOAL. L.A. Bike Trains is already successfully in operation. We need to grow and develop in order to become sustainable within Los Angeles and part of that is also becoming a model for similar projects in other cities, within LA County and beyond. A team of 7+ developers has floundered in making progress on the mobile app because there isn’t money to pay for project development, service costs and other requirements. By funding this position, the already developed specs and project can finally move forward. App development timeline to Beta and Alpha launch is under 10 months. Development is based on ‘open source’ collaborative process, managed through GitHub. Lead developer, Christopher Lovejoy has presented numerous times at ‘Hack for LA, Code for America’ and other community minded coding events. In combination with larger educational partners, like UCLA, we have access to a significant talent pool that wants to work on social benefit/biking related projects while building up their skills and ‘GitHub’ resume of accomplishments. While this is already in place; the people and project management is critical. It’s easier and faster to work with a senior team of experienced developers, designers and managers – however the scope of that budget is far beyond what is reasonable at this time. We understand that there is strength in the collaborative process and working with younger developers allows us the possibility to develop a world class solution with a village budget. We’ve already begun initial relationships, routes and projects with UCLA, (Bike) METRO, USC, the Los Angeles Bicycle Coalition, Multicultural Communities for Mobility, Southern California Association of Governments and others but have been unable to complete or move forward on this progress because no one can dedicate additional unpaid time to these efforts. There is a tremendous amount of potential and desire, but so far the big missing piece is paid development time. By funding enough development time to follow through on grant and award requests, we can not only find additional funding, but begin to become sustainable beyond 2015, ensuring that L.A. Bike Trains not only serves as an inspirational idea, but a true transportation resource for Los Angeles. A new Route takes about $1500 to develop; conductor training, conductor kit, public promotion, system materials revised (online, print), program ‘onboarding,’ back up volunteer development and administrative efforts. #1 Access to a bicycle, helmet, lights and security locks. D.I.Y. If an individual is low income and can afford to pay a small amount, or simply wants to learn how to be completely self-sufficient we can refer them to the Bicycle Kitchen where they will be able to learn to build their own bike with recycled or low cost parts. Additional co-ops in other areas of the city also make this option accessible in the valley, east and west sides of the city. The East Side Riders Bicycle Club has also launched a new location in South LA and we are hopeful that they will also offer a similar program that we can refer people to. Low-Cost: If an individual can afford a new bike, we are working with local bike shops to curate a “package deal” of a quality geared bike (must be approved by L.A. Bike Trains to carry our logo or receive endorsement), helmet and lock at an affordable price point, ideally $550 or around $600. This is an approachable price point when viewed as an alternative to automobile ownership and maintenance, even in low income communities. Lights: L.A. Bike Trains supports the Los Angeles County Bicycle Coalition’s ‘Operation Firefly.’ It’s an annual campaign to purchase front/rear bicycle lights and distribute them for free to bicycle riders throughout LA County that are riding without. This is a huge safety concern and the cost of bike lights is prohibitive for many low income cyclists. We can help fundraise for the purchase of additional lights, provide distribution to communities along our routes and promote ‘Operation Firefly’ to individuals who would be otherwise unaware that such a resource exists. Helmets: L.A. Bike Trains encourages all cyclists to wear bike specific helmets whenever they are riding a bike. We refer low income individuals to friendly local bike shops that we know carry affordable options and offer discounts. We also encourage people to take advantage of online deals and educational giveaways that occasionally happen. Locks: Unfortunately bike theft is a huge problem in Los Angeles. It is an extra devastating event in low income communities where there is no means to replace a bike that may be the sole transportation option. Time – Money – Patience; we need to expand into neighborhoods that do not primarily speak English or spend all their time online. At the same time we’re working on relationships with large organizations that have many of the same hurdles: complexity and long timeframes. Beer me. Los Angeles is one of the world’s most car-centric cities, and when self-professed fearless cyclist Nona Varnado moved there from New York, she faced very real anxiety when trying to share the road with drivers who, she says, would kill you to save two seconds. 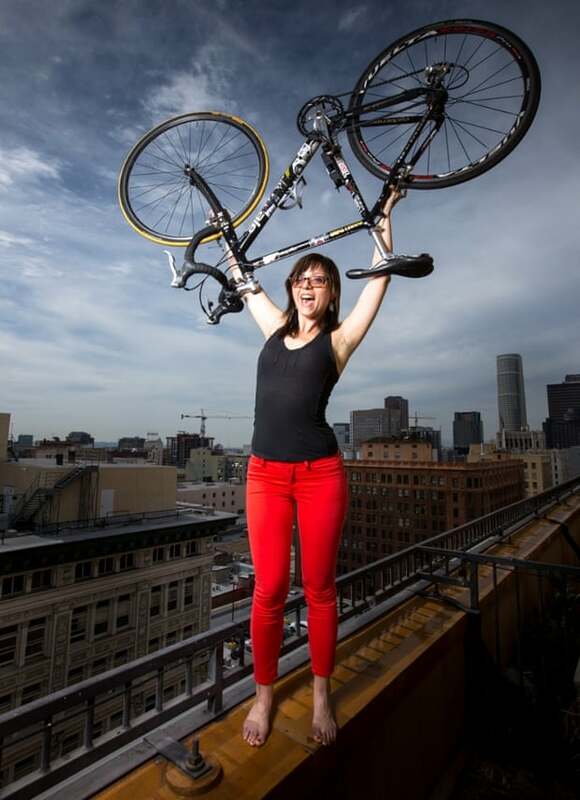 However, after overcoming her own fears, Varnado founded LA Bike Trains – free, weekly rides led by proficient cyclists across the city giving would-be bike commuters the routes, the skills and the confidence to ride to work. That would depend who you ask. I’ve lived without a car all over the world and I’m definitely in the category of what most people would call fearless. When I first moved to Los Angeles I almost bought a car because I was so scared. I’ve been a bike messenger, and when I was younger I did fixed gear alleycat races, really crazy stuff, and so that was why I felt I could go anywhere and ride a bike, no problem. However, Varnado says, LA was a different experience altogether. I was experiencing anxiety, I stopped leaving the house. I realised I wasn’t doing things because in my mind everything seemed so spread out and the sprawl is so great, and the traffic is of a different nature. There’s no regularity between how a lane is between one block to another and drivers are going from 30 to 50 miles an hour to get on the freeway. Trying to get anywhere you’re going to have to go past freeway on-ramps and you’re also dealing with cars that don’t expect a cyclist. To me what is the most scary thing about Southern California is that drivers have this entitlement mentality. That means people don’t care if they kill you. It is as simple as that. They’re trying to save two seconds, and if you need to die to save them two seconds they will kill you. Things turned around for her when, working in an LA bike shop, colleagues showed her how to handle the traffic, and find the “secret” routes away from the main roads. From designing women’s cycle clothes, and talking to women buying those clothes, Varnado saw what she describes as a “huge humanitarian need for activism”, the empowering potential of the bike, financial and otherwise. She also recognised the need for positive one-to-one experiences, like hers at the bike shop, to get people cycling. With protected cycle lanes LA would be a bike paradise, she says, but since she couldn’t build the infrastructure herself, the way to change was a social solution. Varnado studied other bike trains – where they worked and where they fell down, treating it like a business model. Through local campaigners such as the Los Angeles County Bicycle Coalition and Bike Week she found support and a pool of passionate volunteers. Those volunteers were all very vocal. We just started getting people to try it, and they would talk about it with their co-workers and we got picked up on a lot of local transportation blogs. Once it got out that there was some crazy group of friendly cyclists helping people to navigate the city for free, with an emphasis on safety, it became a novelty and so all these media outlets were asking: how is this possible? She believes part of its success is accessibility and fun. There’s no obligation, there’s no pressure, it’s free, it’s not scary, we’re the nicest, most cuddly introduction to biking in LA that you could get. We don’t charge and we’re on schedule every week. That reliability, she says, is crucial, as it is with any form of transport. There are now 10 routes, with an online survey to test demand for more. According to Varnado about a third of her bike train commuters are what she calls graduates, people who build up their confidence and skills over two or three weeks and then leave, hopefully to become independent commuters. The rest, she says, are a diverse array of regulars. This is the big success of LA Bike Trains: We get every shape, age, colour, income. We’ve developed a very flexible model that can go into any community in LA. In younger communities, such as Silver Lake, the bike train is organised online. The south LA train, meanwhile, is run “almost entirely out of a park”. Some conductors (ride leaders) even put hotel-style door hangers on bikes, that look like love letters, to encourage new riders. There are natural fluctuations in numbers, with anything from two commuters upwards in each train. It’s intensive but clearly worth it for Varnado and her team. What kind of people get involved? Have there been any particular success stories? There’s so many, it’s like picking bonbons from a jar. One of my favourites is Barbara. She hadn’t biked in many years, she was really out of shape, she didn’t think she could do it, she needed an incredible amount of help and now she’s a committed regular. Not only has her health improved, now she bikes her daughter to school, so that’s impacted positively on both of their lives. Matthew R. Colleran on Biking to UCLA just got awesome: New partnership with L.A. Bike Trains will launch 3 NEW routes on national ‘Bike to Work’ day, Thursday, May 14, 2015.